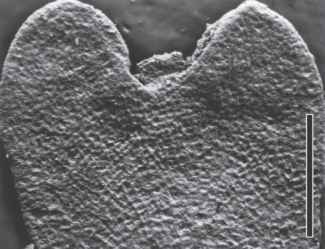 figure 6.15 Cleared tip of Protosalvinia thallus (Devonian). Bar = 1 mm. containing spores as development progresses (Phillips et al., 1972). 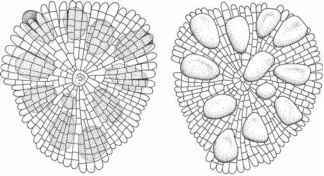 On the surface of the thallus are cell patterns that suggest that thalli dichotomized, and specimens with an apical notch are known. 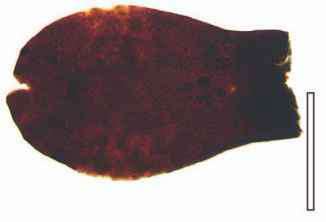 figure 6.20 Protosalvinia spore (Devonian). Bar = 200pm. 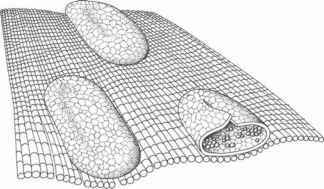 or mitotic products (FIG. 6.20), and thus how they may have functioned in the life history of the organism. 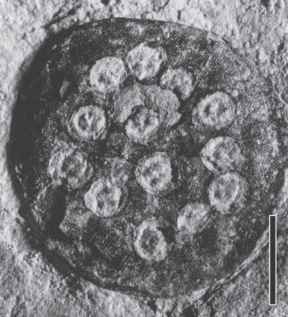 The spore wall ultrastructure suggests that they are the result of meiosis, even though they do not appear to have been constructed of sporopollenin (W. Taylor and T. Taylor, 987). 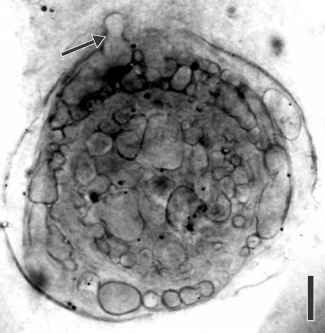 The presence of tetrads of spores does not unequivocally establish Protosalvinia as a land plant, since some red and brown algae also produce spores and eggs that are morphologically similar to the spores recovered from Protosalvinia , but the similarity does not extend to the ultrastructural level. 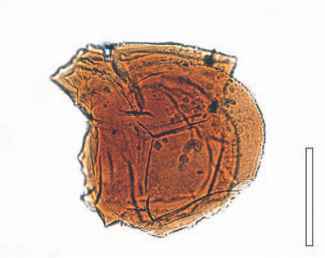 The discovery of lignin-like compounds in the fossils suggests land plant affinities for Protosalvinia (Romankiw et al., 1988), but it has also been interpreted as related to the brown algae based on biochemical evidence (Niklas, 1976b). 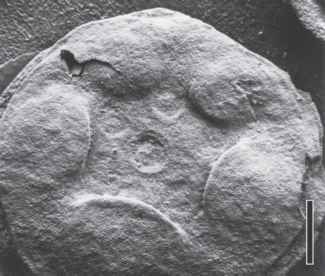 Others consider Protosalvinia inhabited to be an alga that shows some land-adapted features, which may result from convergent evolution at a time when land plants were first becoming established. Gutschick and Sandberg (1991) suggested that Protosalvinia inhabited brackish coastal swamps. Despite all of the tools available to paleobotanists to examine the nature of the organic matter in Protosalvinia, the biomo-lecular signature is neither distinctly marine nor terrestrial (Mastalerz et al., 1998). Some Protosalvinia specimens have been suggested to represent parts of the cephalopod Sidetes (Hannibal, 1994). among Devonian rocks of the Michigan, Illinois, and Appalachian Basins (Matthews, 1983). More recent studies, however, have shown that the age of the Protosalvinia Zone locally varies from middle to late Famennian, which reduces its value as an index fossil and correlation aid. As noted earlier, a Protosalvinia Zone has also been documented in the Amazon Basin of northern Brazil (Grahn, 1992; Loboziak et al., 1997; Melo and Loboziak, 2003). 400 million years between the two taxa, together with uncertainties regarding the life history of the fossil. 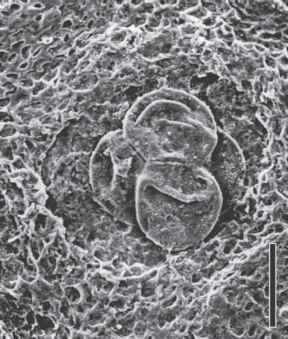 Moreover, antheridia have not been found in P. decipiens, and if these two taxa are similar, the presumed spores in Parka would actually represent zygotes.